What percentage of Americans speak a language other than English at home? More important: does it matter? The backlash — from the left no less – was fast and brutal. Brokaw was accused of being a racist (really?) and of being insensitive to immigrants’ culture. Let’s take a step back and look at some data. According to a WaPo analysis of Census Dept. 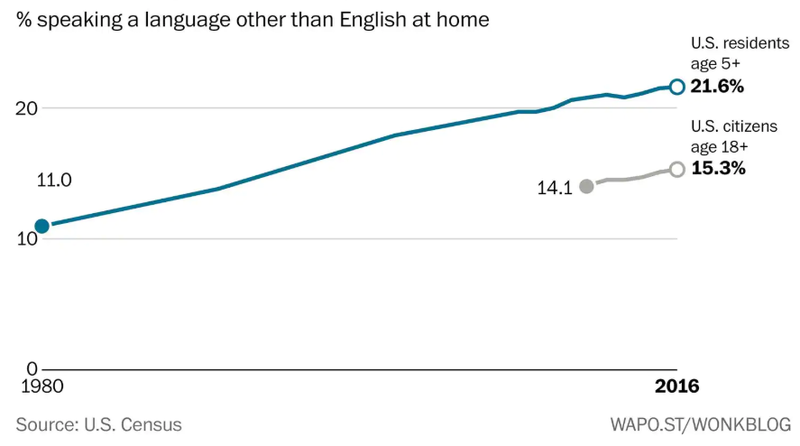 data, about 1 in 5 U.S. households don’t speak English at home. That’s up from 1 in 10 back in the 1980s. A pretty steep increase that begs a bigger question: does it matter?